Generally speaking we are a nation of wildlife lovers. Or at least ‘nice’ wildlife lovers. There are some species which struggle to find a place in our affections, such as magpies, cockroaches and snakes, and some which have only recently endeared themselves, such as toads and bats. At this time of the year everyone’s pet hate is wasps, which is a shame because wasps are very valuable insects. There are nine species of social wasp in Britain, two or three of which have only arrived here in recent years. The largest is the hornet, a fearsome looking, but surprisingly docile, wasp. For most of the year they all go about their business without causing too much irritation, unless they choose to build a nest in an awkward (for us) place. They do like dark corners to live in, often a hollow tree trunk or underground space, but sometimes in a roof space or hanging in a tree. They share a life cycle involving a founding queen wasp emerging from hibernation in the spring and starting a nest. She produces hundreds of worker wasps which then extend and maintain the nest and raise further broods of workers. Throughout the summer these workers feed the broods on all manner of other insects, including aphids. This makes them valuable pest controllers in the garden. In addition, they feed themselves on nectar and other sweet secretions, in the process pollinating many plants, making them doubly beneficial. The problems come in late summer when their nursery duties are much reduced. The new wasps emerging then are males and young queens. They will mate and the young queens will hibernate before starting the whole process off again in the spring. This means that there are lots of more or less redundant workers about just when we are spending time outside. They continue to feed on sweet sugary solutions – not only nectar but also bruised fruit, and of course the jams and other confectionery of our picnics. So, if you can, despite this clash in ours’ and the wasps’ lifestyles, try to tolerate these useful insects. Yes, they do sometimes sting, but not often, and only in defence. 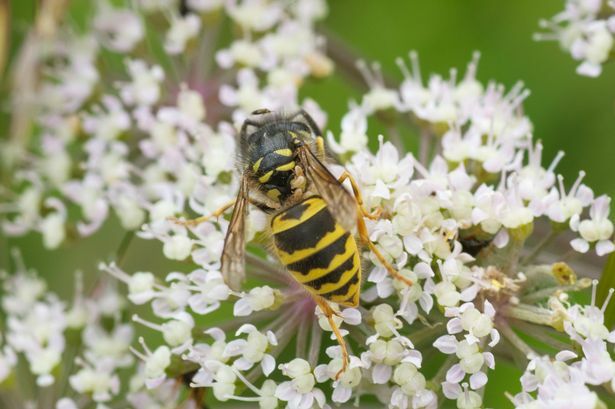 Believe it or not there is now an annual survey of wasps in which you can take part. It is running now, details at www.thebigwaspsurvey.org .